We all know that we need the support of key stakeholders in a change process. And this is absolutely critical if we are talking about potential changes with regards to roles and reporting relationships. A key stakeholder may ignore our proposal for change, support it, or block it – while it is still on the drawing board. So “stakeholder management” needs to be part of every project that aims to re-design the organization. 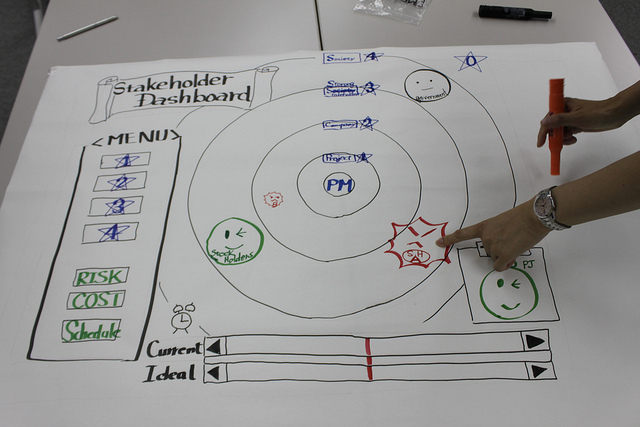 The initial step may be to do a “stakeholder mapping” exercise (as they have done in the image above). You first identify the key stakeholders, and then evaluate their relative power and influence, and what their likely reaction is to the initiative that you are considering. Once you know who they are, you can – according to the textbook – employ “tactics to change the stance of certain stakeholders” or try to “increase the power of certain stakeholders” that agree with you. Or you can try to prevent negative stakeholders from influencing other stakeholders who are neutral or positive toward your initiative. During the re-design process, one can return to the mapping at various points and evaluate whether the situation is changing, and try to pick up signals from key stakeholders that may require action to maintain support for the changes you are planning to implement. So stakeholder mapping is a useful activity. Yet I think many of us feel slightly uneasy about using this approach. It is “us versus them”, it’s about convincing “them” so “we” can get our project through. I am not saying that we should ignore political issues. On the contrary, I have suggested that we always do a “political test” of a proposed new organizational model (see this blog post). And I don’t think it is always possible to reach broad agreement among a diverse group of people in a fragmented system. But still, I don’t feel that the political approach should be the default option. Which leads to the question: Is it possible to imagine a different, “non-political” approach to stakeholder management? It would be based on three key assumptions, which I describe below. There’s actually some research that suggests that it is far more effective in practice. 1. Stakeholders are not “outside” the system that we are re-designing, they are part of it. I have written about Russell Ackoff before on this blog. He argued that system re-design can ONLY be accomplished by stakeholder participation. He also viewed organizations as “open systems”. So you basically need to shift your “level of analysis”. 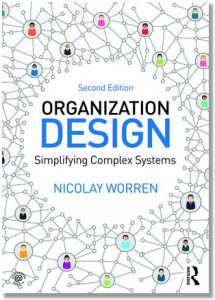 This means that if you are asked to re-design a department, you cannot just look at internal factors in the department, but need to consider the context – and include people outside the department in the re-design process. If you are re-designing an entire organization, you may need to include external stakeholders (or their representatives) such as owners, customers and suppliers. 2. Don’t try to persuade people. We often assume that we need to “sell” people on a particular solution to get them “on board”. As it turns out, this is rarely a successful approach in situations with many different stakeholders and interest groups. Professor Paul Nutt has studied decision making processes in hundreds of firms. He has identified successful and failed decision processes, and tried to untangle the factors that distinguish the two. He has found that in failed decision processes, leaders often went for a solution preferred by the most powerful stakeholder, without even checking whether other stakeholders agreed, and if not, why. The leaders then started to persuade others to adopt this solution. This is also a key weaknesses of the framework I mentioned above – it focuses on “power and influence” of different stakeholders, but seems to ignore the essence, namely what the stakeholders stand for. What are their key concerns, goals or priorities? Paul Nutt concluded that leaders need to uncover these concerns. In an organization re-design process, it may result in a table like the one below, listing the most important “design criteria” for different stakeholders. 3. Develop solutions that satisfy multiple stakeholders simultaneously. Once we understand the concerns of different stakeholders, or more specifically, the design criteria they favor, we can move to the next step. We can ask ourselves whether the criteria are complementary to each other or whether they are in conflict. If one discovers that two criteria are in conflict, it is common to assume that one needs to either focus on one, or to find a compromise (a solution that is equally bad on two criteria). A stakeholder approach to business is about creating as much value as possible for stakeholders, without resorting to trade-offs. In other words, the challenge is to develop solutions that satisfy more than one criterion at the same time, or meet the expectations of more than one stakeholder. But at the very least, this is what we should aspire to when we re-design our organization. I would like thank Hans Lekkerkerk, a lecturer at Radboud University in the Netherlands, for taking the time to discuss this topic with me and for providing useful suggestions. *Johnson, Scholes, & Whittington (2014), Fundamentals of strategy. Nicolay: This is an important article. Thanks so much for posting it. In our system redesign projects in healthcare, we also did a political analysis in the planning and design phases. It seemed this activity helped to relieve some of the anxiety of the redesign task force–acknowledging their concerns and fears. You approach, trying to take the power and influence, not to mention the coercion, out of a process is an important step. But please keep the political analysis in the process. It can reveal so much about who can send torpedoes to sink a re-design effort. Currently in the news, the U.S. VA system is an excellent example of way too may clashing personal and cultural political agendas by some pretty deeply entrenched employees. They just cannot seem to catch a break. Gene, I agree. One can go too far in the direction I describe..we need to avoid becoming naive. One of the questions in our discussion was: How to involve your stakeholders? Do you bring all internal sh’s (employees, managers) together in a large group intervention meeting, or just (elected) representatives? And for external stakeholders; you may assign members of the design team a stakeholder-role (pretend you’re a supplier, what value would you want from us?) or you invite your stakeholders to table in person to help formulate the design requirements (like Whole Food Market does, see book by Mackay/Sisodia ‘Conscious capitalism’). @Gene, In the book mentioned + in ‘Reinventing organizations’ by Frederic Laloux politics are more or less equaled to ‘ego’-driven optimization of just one of the multiple values to be created at the cost of the others (e.g. profit maximization, vertical career paths). As soon as you succeed in convincing owners & the board & the C-suite that MVC is the only long-term viable option, you only have to discuss the means. I think that can be a much less political discussion.